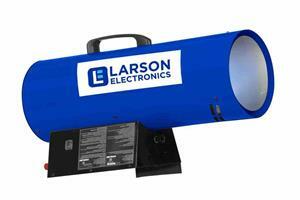 KEMP, Texas, Nov. 09, 2018 (GLOBE NEWSWIRE) -- Larson Electronics, a Texas-based company with over 40 years of experience spearheading the industrial lighting and heating sectors, announced the release of a 120-volt adjustable natural gas forced air heater that provides 435 CFM of air flow and 150,000 BTUs of heat output. This portable indoor-use heater is mounted on a flat base and is equipped with a 10-foot hose and regulator. This natural gas unit provides 435 CFM of air flow and 150,000 BTUs of heat output during operation. Capable of thermostat and electronic ignition, the portable heater is mounted on a flat base and comes with a 10-foot hose and regulator.